We’d thought about going to Australia for years, as holding a koala was on Susan’s “bucket list,” but it moved up on our destination list after Phil read “Carnivorous Nights: On the Trail of the Tasmanian Tiger,” which highlighted the amazing animals, the landscape, and the people of Tasmania. As Australia is larger than the continental USA, we decided to minimize air travel and focus on the south east corner of the country. We flew from LAX to Melbourne to Hobart, Tasmania’s capital city. While Phil struggled to adapt to driving on the left, our introduction to Australia was the abundant wildlife strewn (whole and in parts) all over the roads. We’ve never seen so much roadkill; a sobering reminder that driving after dusk was very risky. However, the abundant live wildlife meant many opportunities to see animals unique to Australia. After checking into our hotel in Port Arthur just hours after leaving the airport, we visited some nearby caves (aptly named “Remarkable Caves”) and watched a pademelon (a small racoon-sized wallaby, found only in Tasmania) hop around the parking lot. On our first full day we decided to take a challenging hike on the Tasman Peninsula out to Cape Huay. A wallaby bounding across the road was our “good morning and welcome to Australia”. Another wallaby was grazing in the parking lot near the foot of our first day’s hiking trail. The Tasman Peninsula is stunning. Beautiful views over the rocky cliffs of Cape Huay and our first sightings of echidnas (which are rare – we were lucky!) were our reward on our first full day in Australia for six strenuous hours of hiking up and over mountains. Over the next 6 days we traveled through Tasmania, an under populated island with beautiful hikes, lovely inns, and delicious fish. We’d planned our time in Tasmania to visit several state parks. After leaving the Tasman Peninsula, we drove north and took a ferry to Maria Island. The island has abundant wildlife – a gaggle of Cape Barren geese greeted us, and we saw our first wombat. While Susan tried to learn how to use her new smart phone to take pictures, she got within a foot of one of these wonderful creatures, which are 40-50 pounds and resemble a tailless large hamster with cute tufted koala-ears. A day later we drove via Launceston, a small city with Victorian architecture and an Egyptian revival synagogue, to the northern part of the island. We spent one full afternoon and evening at Narwantapu, a state park where herds of kangaroos gather at dusk, and sat quietly watching mothers with babies (joeys) in their pouches while they eyed us warily. On the way home, we saw a pair of small bright eyes reflected in our headlights, and were fortunate enough to see a rare quoll, a carnivorous weasel like animal – small, brown with bright white spots. The next day, after the first of many futile excursions to see the elusive platypus, we went to the amazing Cradle Mountain area. Two highlights were hiking around the beautiful lake with a crystal clear reflection of the mountain, and seeing Tasmanian devils. The Tasmanian devil is nocturnal and rarely seen in the wild, so we decided to go to a preserve at Cradle Mountain (Devils@Cradle) to see them. The preserve is focused on protecting the devils, whose population is being ravaged by a disease that causes cancerous growths on their faces and mouths. In addition to learning a lot about the devils and being able to see several, the preserve had recently been given an orphaned wombat baby whose mother had been killed by a car. Susan was able to hold the baby, and began hatching plans immediately for how to get a wombat through security and back to Boston. We knew that it was extremely difficult to see a platypus in the wild, but that didn’t stop us from trying. We made several attempts in Tasmania and later in the trip attempting to stake out ponds and rivers where they had been spotted, but it was the one animal we never managed to see, despite many hours in mosquito infested swamps. From Tasmania, we flew to Adelaide. The museum there has an incomparable collection of aboriginal art and of art from the Pacific Islands; we spent several hours there. After a taste of the city, we got another car to drive down the peninsula to take a ferry to Kangaroo Island, where we spent 5 days. Kangaroo Island is sparsely populated, with most of its small population concentrated on the northeast part of the island. Our destination was the southwest corner, Flinders Chase, a national park known for its koalas, kangaroos, sea lions, and unusual rock formations. On our way across the island we stopped at a wonderful preserve, Kangaroo Island Wildlife Park, where Susan was able to satisfy her longing to hold a koala and feed a wallaby. Koalas sleep 22 out of 24 hours, and are, well… dumb. 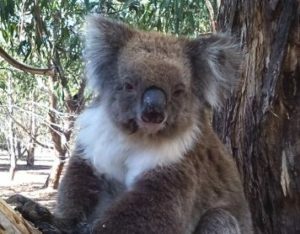 Their brains are the size of a walnut, as most of their energy goes into turning the acidic eucalyptus leaves that they eat into something they can digest and exist on. They are as cute and soft as their pictures lead one to expect –but…while holding one, Susan discovered how very sharp their claws are – the one she was holding decided she was a tree and so decided to “hang on tight”. But it was worth it. We also got to feed some kangaroos and wallabies and hold a baby possum at the preserve – a much cuter animal than the American possum! Our lodgings at Flinders Chase were right on the edge of the park, and we woke each morning to birds. One morning, however, we heard something that sounded like a donkey braying. We couldn’t imagine the bird that could make such a sound. A few days later we learned that this is the sound of male koalas seeking a mate – how could something so cute make such an awful noise? On one of our drives we saw a large snake (5 of the 15 most poisonous snakes in the world are in Australia – we didn’t get out of the car to check this reptile out!) and a goanna, a very large lizard. The Remarkable Rocks and Admirals Arch in the park were even more dramatic than their photos, amazing examples of the power of erosion. Near our accommodations was a local park that included a “koala walk” – a stand of gum (the one type of eucalyptus that koalas eat, of the 40 species of eucalyptus in Australia) trees where one could almost always spot a koala. On our first evening we spotted 8 up in the trees, including one mother and baby. On our last night on Kangaroo Island, we decided to return to the walk. It was a very hot day, and to our delight, koalas had descended to lower branches to escape the sun – and we saw 5 different ones at eye level! They were all sleeping, but our footsteps on the leaves caused most of them to lazily open their eyes with a look that seemed to ask why we were disturbing their all- important naps. On our last afternoon on the island, we crossed back towards the ferry and stopped at Penneshaw for some bird watching. The parrots, cockatoos, gulahs, ibises and pelicans were abundant, and the variety of birds beyond what we’ve seen anywhere. From Kangaroo Island, we returned to Adelaide. Disembarking from the ferry, the fields were covered with kangaroos. An amazing sight to watch the sun slowly set over hills that these animals were hopping across. By this point in the trip, Phil was an expert at driving on the left, and had even stopped squirting cars with his windshield button when intending to signal as he passed them. From Adelaide we flew to Sydney, where we spent a day exploring the harbor and museum. While one could certainly have spent more time there, we had decided to limit our time in cities to spend as much time as possible in the national and state parks. From Sydney, we took a 5 day drive down the coast to Melbourne, exploring small towns, dairies that made their own cheese, and the beautiful coastal road. Near Merimbula, we found a field full of kangaroos one evening – they truly are all over Australia. We took a side trip to Raymond Island, where we saw kookaburras and watched/heard a koala making the ridiculous braying mating call. A highlight of the drive towards Melbourne was Wilson’s Promontory, a state park where we were able to see dozens of kangaroos and several wombats, as well as beautiful ocean views. We ended the trip with 2 lovely days visiting Phil’s cousins Ori and Lisa in Melbourne. We had not seen them for nearly 25 years, and were so happy to meet their adult children, Sea and Anafa – and two grandchildren! We did some exploring of Melbourne with them and a lot of time just catching up. Throughout our trip, we were fortunate with the weather, and the sunshine was a great respite from the record breaking snowfall in Boston. While we missed all of the February blizzards, after the 27 hour flight from Melbourne we returned to 8 foot high snow mounds, 2 foot high piles of mail, and way too much email.